Expedia has some excellent Epron packages waiting for you. Bundling your lodgings and airfares is one of the simplest ways to save cash on your vacation. Savings of up to 42%* are available to smart travelers who book a package deal on Expedia. In a matter of minutes, you can organize everything you'll need for your next trip with our exhaustive database. And — with more than 400 partner airlines and 321,000 properties from all around the world, you'll have the freedom to mix and match! If you have to change your vacation plans, we will honor your cancellation request on nearly all bookings with no hidden fees. We've got all the sightseeing info you require for your next trip to Epron. Grab your travel organizer and get ready to start topping up your itinerary. If you're in the mood to check out some local highlights, write Festyland on your itinerary. It is sure to impress! Countless great thinkers and trailblazers have studied within the lecture theaters of University of Caen Normandy. Learn about its long history and accomplishments, and walk through the campus during a tour. Visitors have an abundance of choice in and around this destination. Discover the age-old rooms, corridors and halls of Caen Castle. This grand fortification provides an informative excursion for everyone. Still got some time on your hands? Want to add some greater meaning to your travels? Make the journey to Eglise de la Sainte Trinite. No matter what your spiritual beliefs, it's a great place to observe and learn about the local faith. Epron has 46 centrally located properties, so why hesitate? Choose your ideal accommodations for your luxury getaway or cheap vacation with a little help from Expedia. It's not every week you get to go away, so why not spend a couple of nights in a posh room at the Ivan Vautier (3, Avenue Henry Chéron) or the Best Western Plus Hotel Moderne (116 Boulevard Marechal Leclerc)? With five-star service and top-level amenities, you'll feel like a VIP! Rather cheap and chic? Have a look at the Inter-Hotel de France (10 Rue De La Gare) and the Le Bellevue (89 avenue Henry Chéron). The airport probably won't be the most memorable moment of your getaway, but there's nothing like the feeling of knowing that your well-deserved trip to Epron is just a plane trip away! Once the wheels hit the tarmac at Carpiquet Airport (CFR), you'll be 5 miles (8 km) from the center of town. 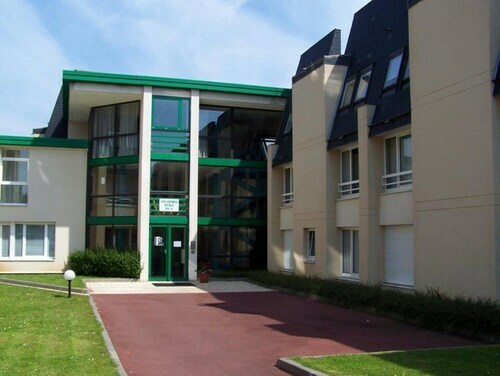 Located in the heart of Epron, this residence is 1.2 mi (1.9 km) from Caen University Hospital and 2 mi (3.3 km) from Caen Memorial. Faculty of Pharmaceutical Sciences of Caen and University of Caen Normandy are also within 3 mi (5 km). 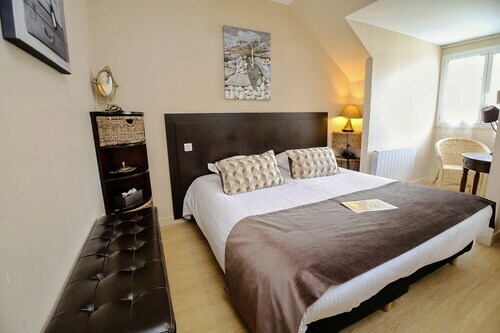 Located in the heart of Bayeux, this hotel is within a 5-minute walk of Cathedrale Notre-Dame Bayeux, Baron Gerard Museum of Art and History, and Museum of the Bayeux Tapestry. Bayeux British War Cemetery and Museum of the Battle of Normandy are also within 15 minutes. Bayeux Station is 11 minutes by foot. 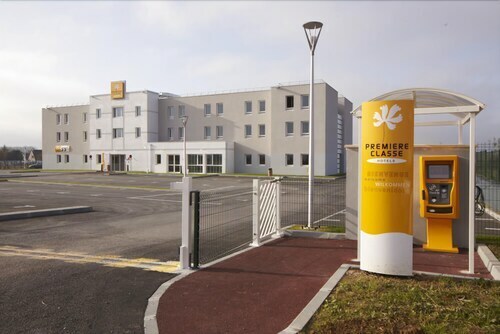 Located in the heart of Saint-Contest, this hotel is within 3 mi (5 km) of Caen Memorial, Caen Botanical Garden, and Abbey of Saint-Etienne. Caen University Hospital and Michel d'Ornano Stadium are also within 3 mi (5 km). With direct access to the beach, this Cabourg hotel is within a 15-minute walk of Promenade Marcel Proust, Cabourg Beach, and Seine Bay. Cabourg-Le Home Golf and Cabourg Mini Golf are also within 1 mi (2 km). Dives-sur-Mer Dives-Cabourg Station is 23 minutes by foot. 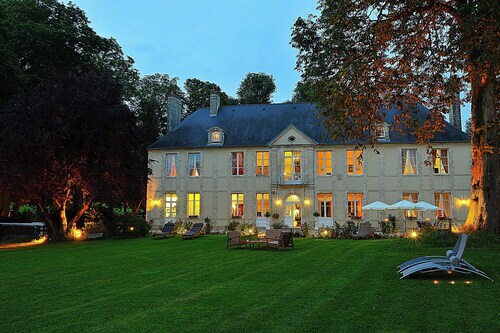 Located in Hameau de la Folie Couvrechef, this golf hotel is within 3 mi (5 km) of Caen Memorial, Caen Botanical Garden, and Abbey of Saint-Etienne. Caen University Hospital and Michel d'Ornano Stadium are also within 3 mi (5 km). Situated in Bayeux, this hotel is within 1 mi (2 km) of Museum of the Bayeux Tapestry, Cathedrale Notre-Dame Bayeux, and Baron Gerard Museum of Art and History. Museum of the Battle of Normandy and Bayeux British War Cemetery are also within 2 mi (3 km). Bayeux Station is 12 minutes by foot. Situated in Bayeux, this hotel is within a 10-minute walk of Baron Gerard Museum of Art and History, Cathedrale Notre-Dame Bayeux, and Museum of the Bayeux Tapestry. Bayeux British War Cemetery and Museum of the Battle of Normandy are also within 1 mi (2 km). Bayeux Station is 17 minutes by foot. Located in Caen City Centre, this residence is 0.6 mi (1 km) from Church of St. Pierre and 2.1 mi (3.4 km) from Caen Memorial. Prairie Racecourse and Caen Museum of Fine Arts are also within 1 mi (2 km). Caen Station is 9 minutes by foot.